There’s a new pattern in the Crochet Spot Store! This is a simple pattern for classic baby booties that leaves a lot of room for your own imagination. Add edgings, appliques or anything you’d like to customize these booties. 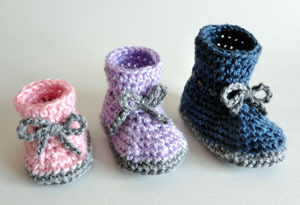 The booties are crocheted with one main color and a contrasting color on the bottom and on the tie. They are made seamlessly in the round from the bottom up so that no sewing is required. This entry was posted on Sunday, January 29th, 2012 at 4:39 PM by Rachel Choi	and is filed under Best Crochet Patterns. You can follow any responses to this entry through the RSS 2.0 feed. You can skip to the end and leave a response. Pinging is currently not allowed. Could you suggest what kind of yarn and weight would be best to use for babies? I usually use Red Heart yarn but I’m worried the quality might not be so good for babies. You can use Red Heart, but I would suggest washing your finished item a few times. That way it’ll make the yarn nice and soft. One of my favorites is Caron Simply Soft yarn, just because of how soft it is. You can probably use any weight of yarn to make baby items. You should probably use whatever weight the pattern suggests if you’re following a pattern.